Trust our northern hemisphere readers are bearing up with winter – and our southern hemisphere colleagues with summer! Not a bad winter so far in the Great White North, bright blue skies, and less snow than usual. For fans of the Toronto Maple Leafs hockey club, however, it’s another winter of discontent. The Maple Leafs, one of ice hockey’s iconic teams has made the NHL playoffs exactly once these past 11 years, and has not won the Stanley Cup in 48 years. In their first half century, by contrast, the Leafs won 11 Stanley Cups, and were famous for their tenacity and grit. This year the Leafs are cellar-dwellers once again, having now lost 11 straight games, and 17 out of 20. Yet, Maple Leafs Sports and Entertainment (MLSE) continues to earn record profits. Such is the appetite for hockey in Ontario. Can you imagine Bayern Munich, the New York Yankees, New Zealand’s legendary All-Blacks or any other team sinking so low? Didn’t think so. What are these causes? And are there management and life lessons in the Maple Leafs’ demise? I hope you’ll indulge me a Fan’s Five-Why Analysis - (ahem, FFWA…). Why has the richest team in the NHL sunk so low? Because the players aren’t very good and they don’t care. 3rd Why? Because senior management doesn’t care that their general manager, coaches and players aren’t very good and don’t care – and that the management processes around the team are lousy. 4th Why? Because senior management is focused on making money, not on sporting excellence. 5th Why? Sporting excellence does not help MLSE make money. At least one senior executive has admitted, infamously, that MLSE makes more money when the team is marginal. 6th Why? There is no competition. The NHL has granted the Leafs a de facto monopoly in a hockey mad region. Applications for new NHL teams in southern Ontario have been repeatedly rejected (after intense lobbying from MLSE). In summary, the root causes of the Leafs’ catastrophic failure include a) disengaged senior management for whom profitability is paramount, and b) market failure aided & abetted by the NHL. There are other root causes, of course, which a detailed investigation would uncover. But these seem central to me, and to most other commentators. A sorry state of affairs! Next time – are there any possible countermeasures? 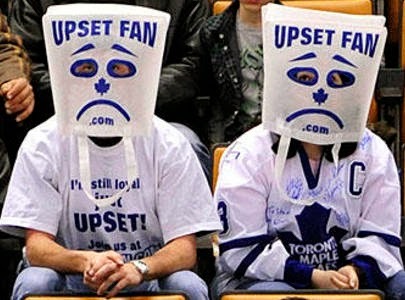 Do forlorn Leafs fans have any hope?